Affordable timber driveway gates for sale in a timeless style. Suitable for any residential entrance. Attractive arched top adds charm & character. 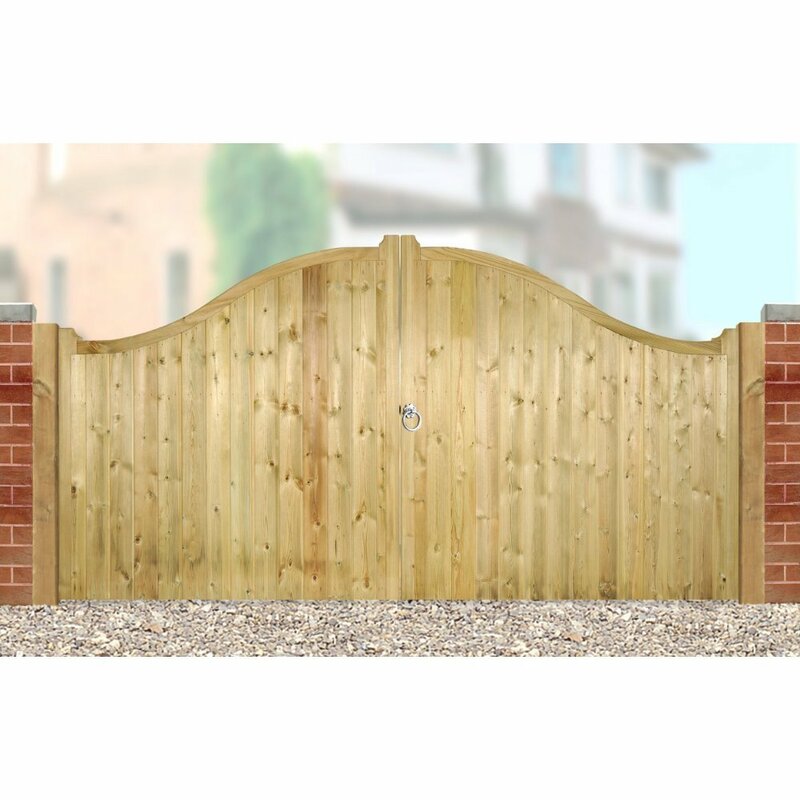 Suitable for any residential application the Drayton Shaped Top Wooden Driveway Gates feature a distinct curved top which can be fitted in either a high centre or low centre configuration (depending on your personal preferences). Handmade in the UK to industry leading standards, these great value driveway gates offer a timeless appearance that will blend well with any type of UK architecture making them suitable for any large entrance that would benefit from additional security without having to compromise on aesthetic appeal. 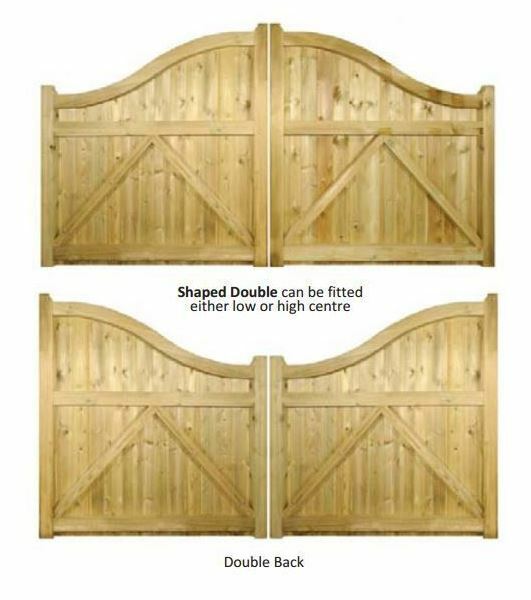 Shaped to double gate design can be fitted with a high or low centre. High quality mortise and tenon jointed construction offered for sale at a competitive online price. Will enhance the look of any residential driveway entrance. Drayton wooden gates are handmade using pressure treated timber. Features a 70mm x 70mm framework, 70mm x 54mm & 44mm x 44mm timber bracing and 95mm x 14mm tongue and groove boards. A range of hinges, posts and accessories are available to order separately. Select the width required from the menu above. 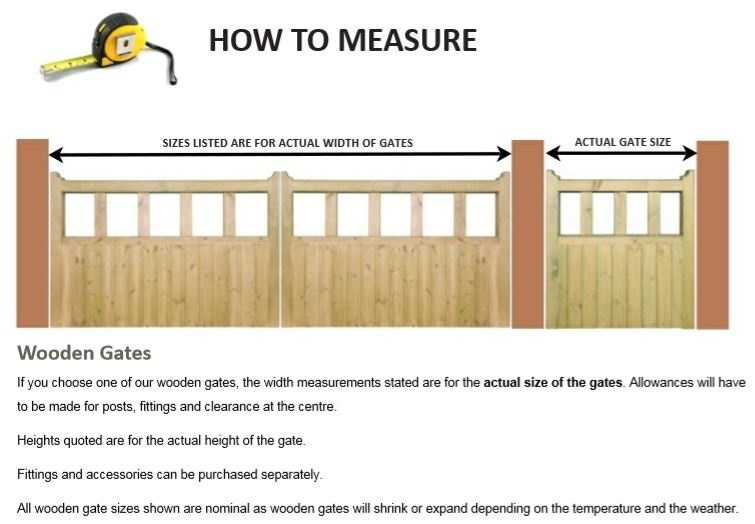 Please be aware the sizes represent the physical width of a pair of Drayton Wooden Gates placed side by side. We have made no allowance for the space needed for the hinges and fittings. Looking for help ordering Drayton Shaped Top Wooden Gates Online? Call now on 0844 804 5577 or email sales@gardengatesdirect.co.uk and we will be on hand to offer support. Alternatively take a look at our measuring guide, ordering guide and frequently asked questions. You can also find information on installing the gates by clicking the links below. If you need to order posts and accessories please choose from the options detailed below. For help and advice choosing the correct sizes hinges or posts for a particular gate size or would like to speak with us prior to placing an order online please call 0844 804 5577 or email sales@garengatesdirect.co.uk and a member of staff will be available to provide support.